First thing today we visited the walled town of Beaucaire (across the River Rhone from Tarascon) and after yet again another mind-numbing old town experience we headed northwest to the Robert Louis Stevenson trail in the Cevennes. 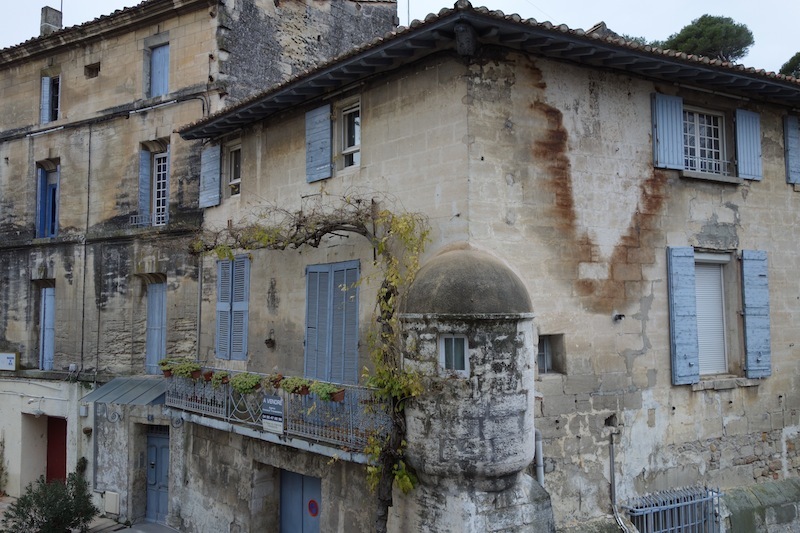 Beaucaire exudes history and ancientness at every turn and of all the French villages we have visited on this odyssey it is where, if we wanted a lifestyle change, we would head. Beaucaire’s uniqueness relates to the fact that various peoples have occupied the region and they have all left a historical footprint. One significant era of history relates to Roman times especially when Gnaeus Domitius Ahenobarbus arrived in 118 BC and built a road, the Via Domitia, through Beaucaire. 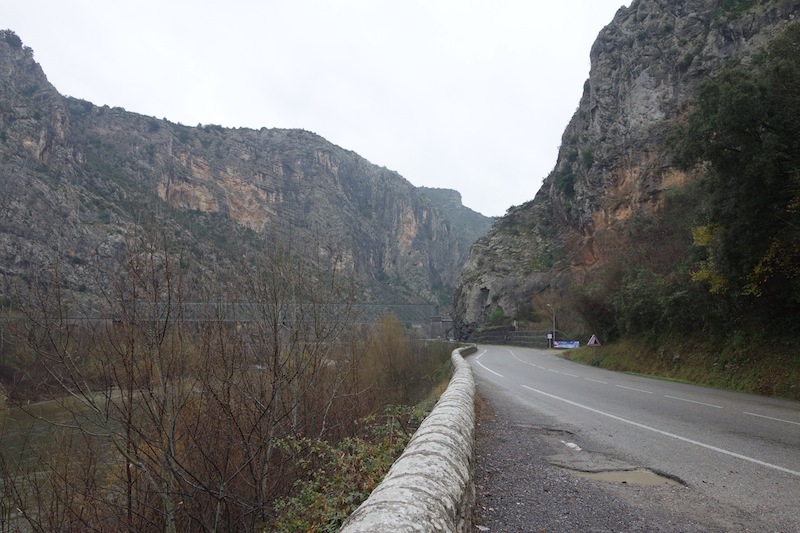 The aim of the road was to secure Roman possessions in Spain and it formed part of a road network running from Rome to Cadiz in Spain. 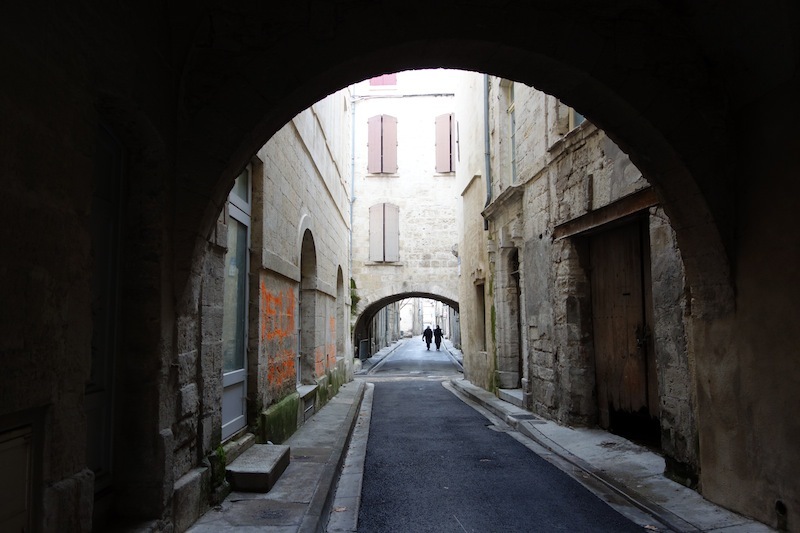 Once the road was built towns along the route began to prosper, especially those like Beaucaire with River Rhone access. After the fall of the Roman Empire one of the next big players in Beaucaire was Charles VII of France (1453) who established the Foire de la Madeleine. The Foire de la Madeleine was a commercial fair that would enable the trade of goods from all of the Mediterranean Basin countries to all of France. By the mid seventeenth century, the Fair was the largest commercial fair in the Mediterranean region, exceeding in six days the total volume of trade done in Marseilles in a year. It remained the dominant trade fair until the arrival of the railway in the mid nineteenth century. Madeleine’s Fair is presently celebrated with six days of festivities commencing on the July 21st every year. Up to three hundred thousand people attend and join in festivities which includes the running of the bulls. 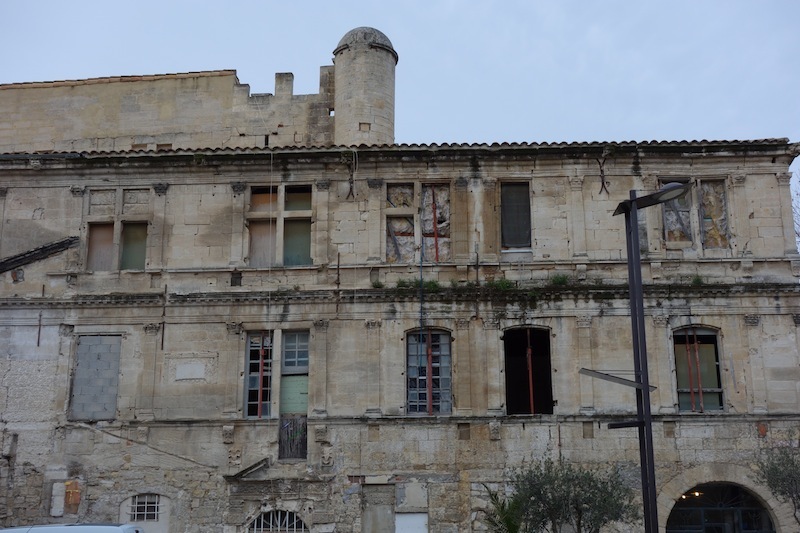 Outside the fair and tourist season the town of Beaucaire is a very quiet location and as we wandered today I felt we were actually walking around a living archeological site. 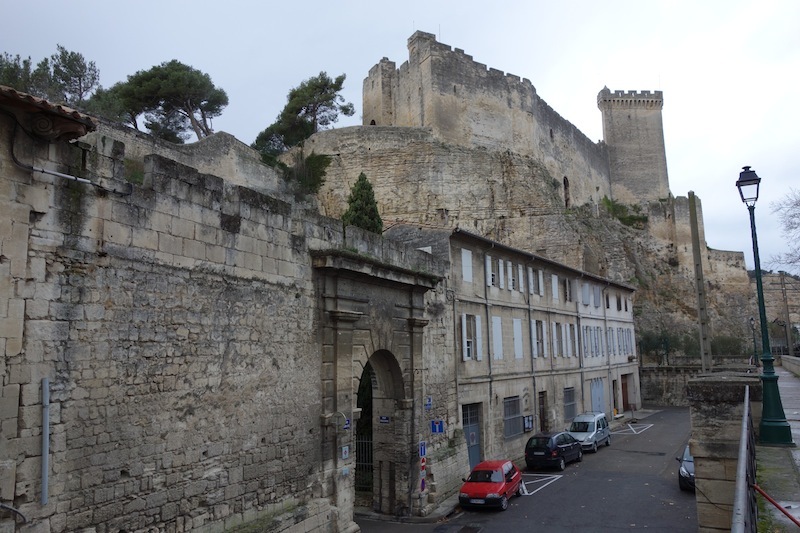 The Castle of Beaucaire and one of the entrances into town. 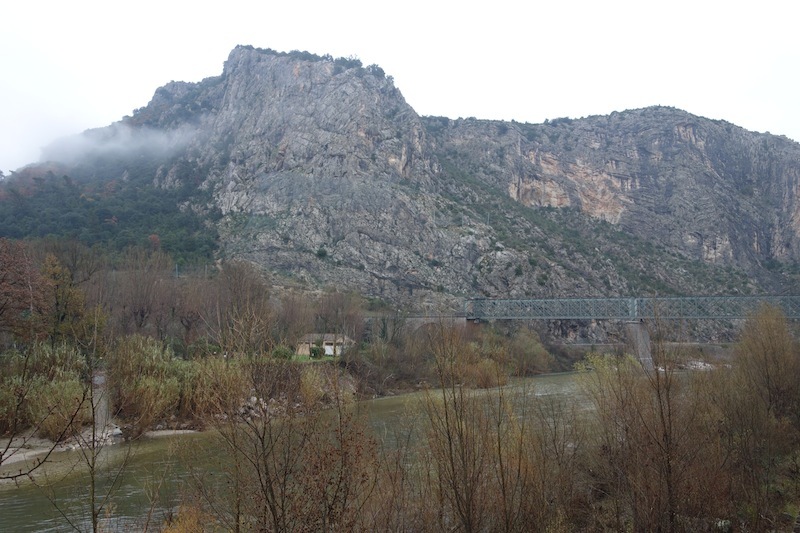 The rocky outcrop dominating the river and town on which the medieval castle sits was occupied as far back as the 6th century. When the Romans arrived they built a ‘way station’ there. A way station was a secure place where travelling officials stayed. 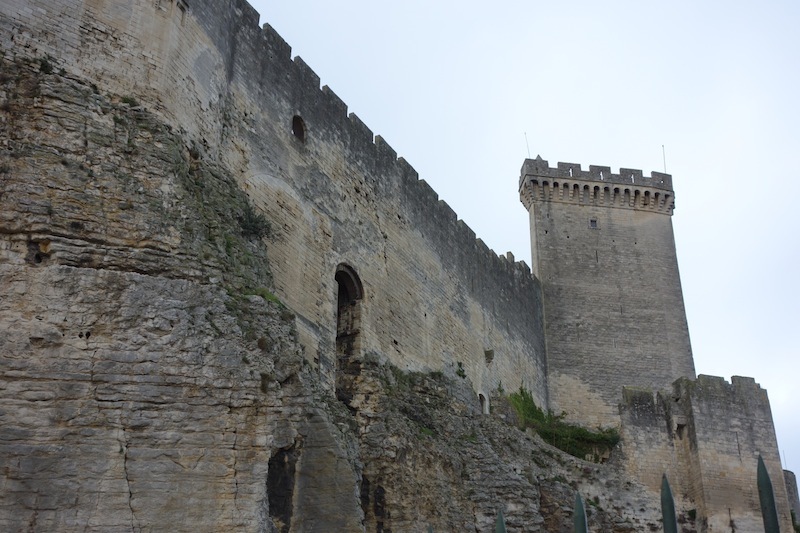 The notched battlements (crenelation) of the Beaucaire Castle. The opening in the battlement through which soldiers fired is called a crenel and the raised sawtooth is the merlon. Behind the battlement is the wall-walk or allure along which soldiers patrolled. A medieval laneway inside the protective walls. If only the walls could talk. Modern day chariot passing through a snickleway. The town’s covered market. 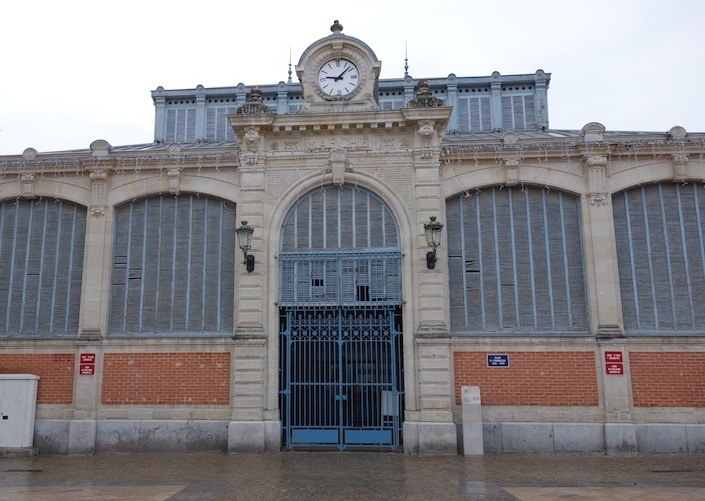 The amazing thing about this building is the blue wooden louvres. Can you imagine the work installing and maintaining them! 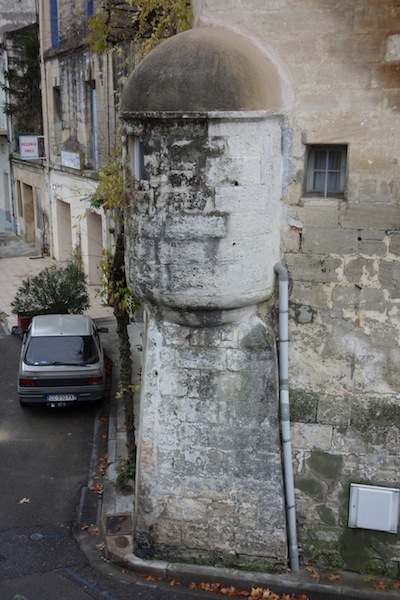 The projection (turret) on the corner of this building is a bartizan. In days gone by it would have served as a lookout or for the defence of the building. Today I am fairly confident it houses a W.C. (water closet). The following photograph shows why I am of this opinion. 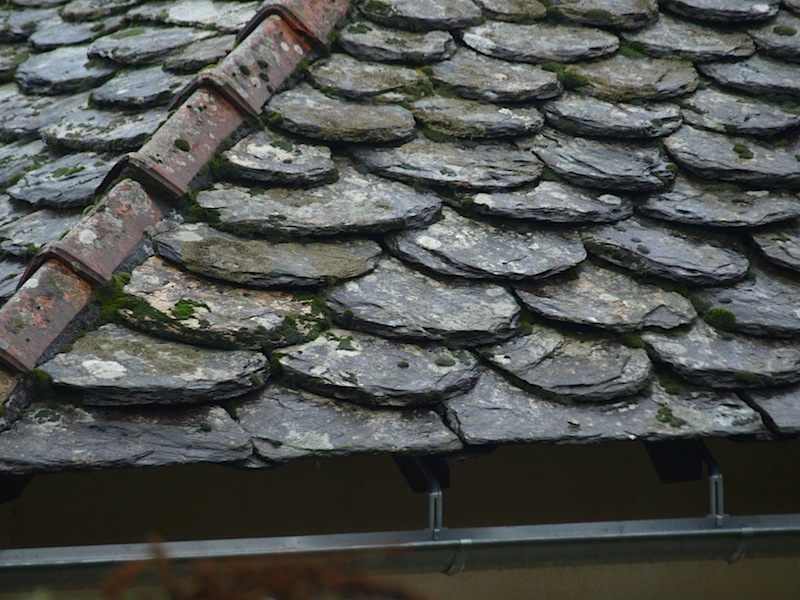 The word bartizan comes from the alteration of Middle English bretasinge, from bretais parapet. I reckon the PVC pipe coming out of the wall is the outlet of the WC pedestal. 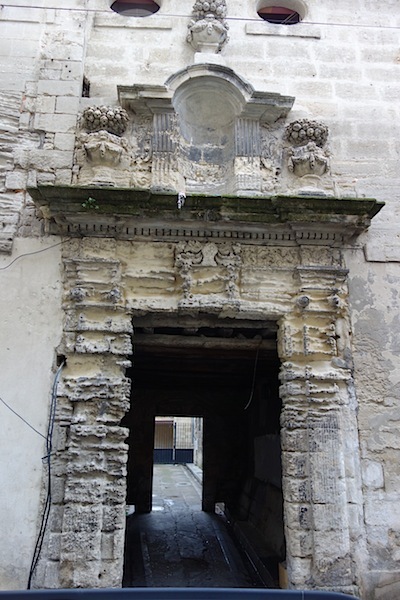 Following are images of Beaucaire doorways. 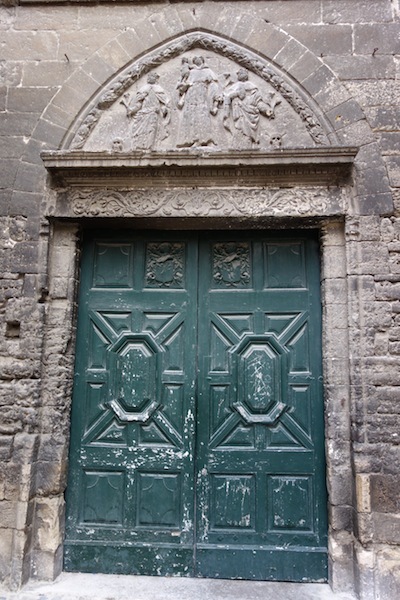 Every doorway in Beaucaire has locked behind it stories that will never be told. Isn’t it frustrating, not being able to unlock the stories? 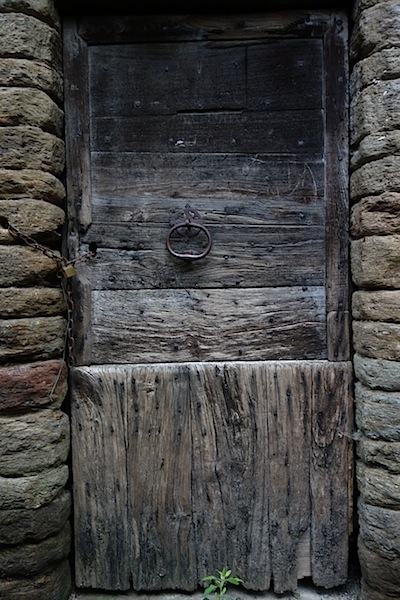 One of the many doorways to history. I was told this was the entrance to a Christian monastery. However I do wonder about the Jewish Star of David in the window. Over the centuries Jewish people have come, gone and been expelled from Beaucaire so maybe it was a synagogue at some time. Another historical doorway due for a second repair job. What’s behind the green doors? And what is the story depicted in the bas relief above the door? 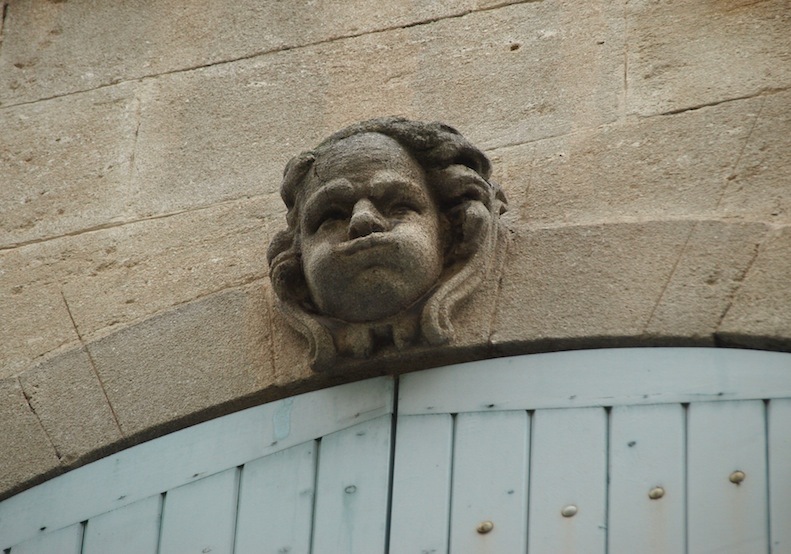 Who carved these beautiful keystones in the following images? Following are more treasures on high. Bronze gargoyle. 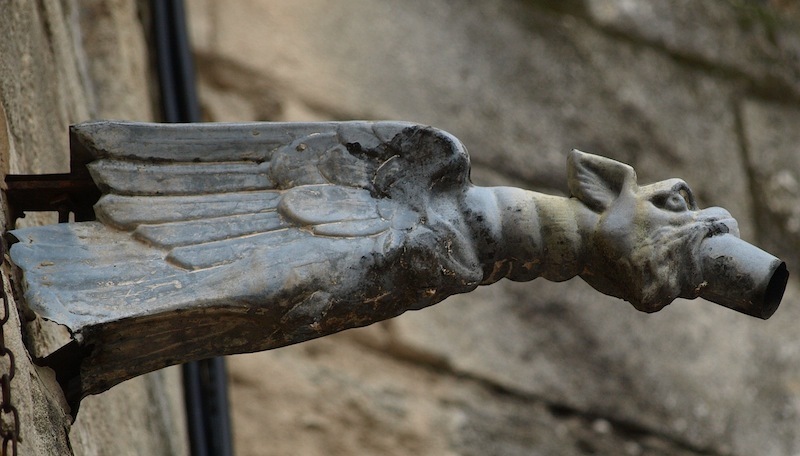 The object in the gargoyle’s mouth is a spout, not a plug . 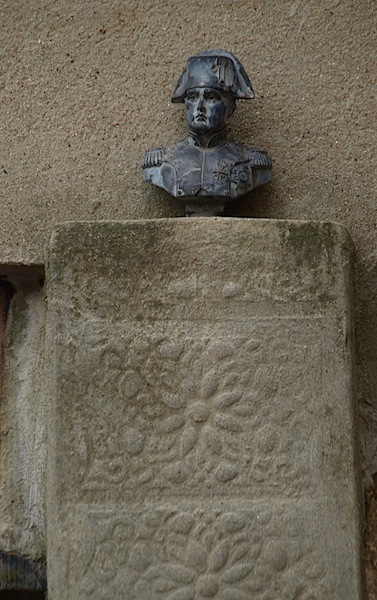 Napoleon, on a pedestal above a window. The bronze was about 100mm high. Napoleon Bonaparte visited Beaucaire in July 1793 and at that time he spoke and dined with four merchants worried about unrest in the Republic. 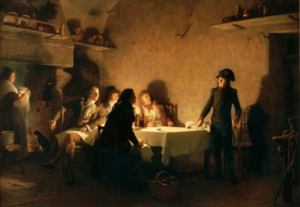 After this dinner (supposedly the next day) he wrote a text in the form of a dinner-table discussion imitating a Socratic dialogue (where moral and philosophical problems are discussed), called The Supper at Beaucaire in which he professed his Republican beliefs and attempted to convince his readers of the necessity of the Revolution and the horrors of civil war such as he had recently witnessed at Avignon nearby. Sign near the Napoleon miniature. I have a feeling that it may have been in this vicinity that Bonaparte dined. If any reader knows more please let me know via the comments page. After a very historical morning we reluctantly bade farewell to Beaucaire and headed north west to Robert Louis Stevenson country. 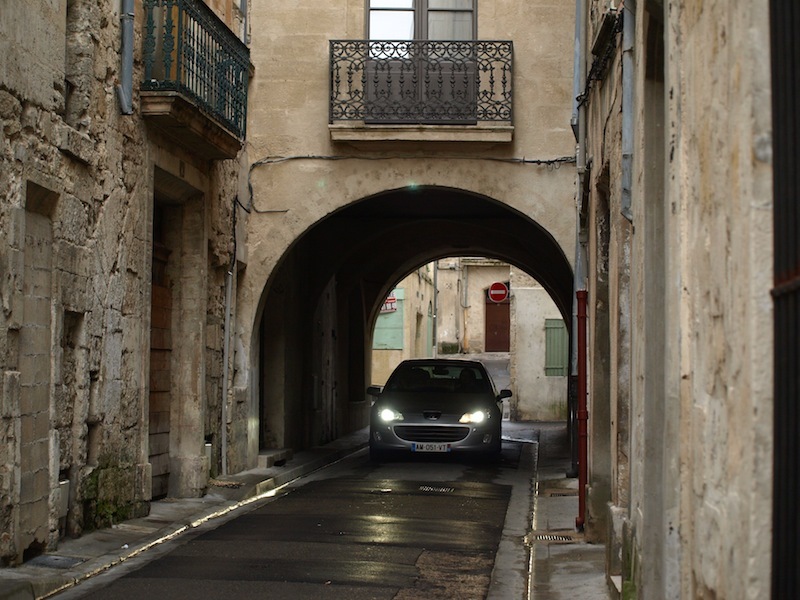 Unfortunately not all roads in southern France are as deserted as this one. 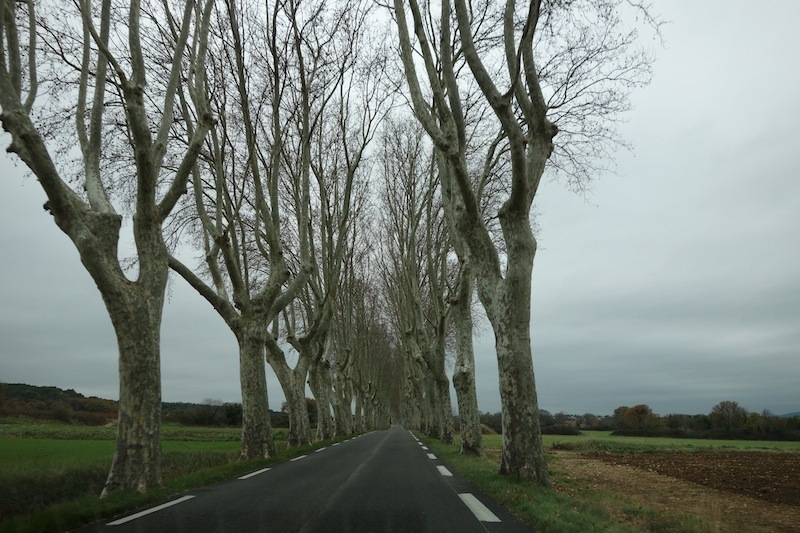 An avenue of wonderful plane trees. 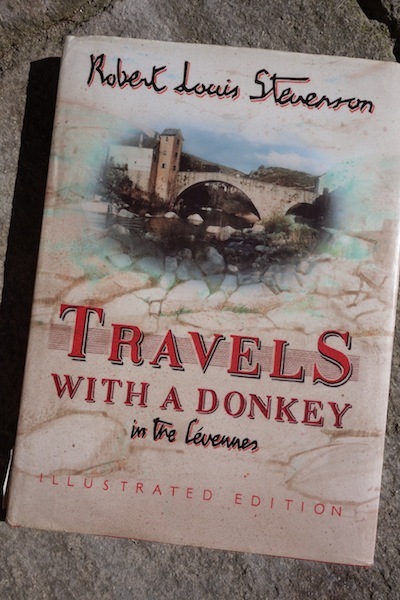 My interest in the Robert Louis Stevenson trail started after reading his narrative ‘Travels with a Donkey in the Cevennes’ about twenty years ago. Also more RLS inspiration came from the fact that Treasure Island, Kidnapped and Doctor Jekyll and Mr Hyde, also written by Stevenson, were compulsory reading when I was a teenager. The book that was the inspiration to visit the Cevennes. It is considered to be a pioneering classic. This book was conceived, edited and designed by Beanstalk Books Ltd London. ISBN 0-7011-3137-3 This publication may no longer be in print so if you want one get on the web and go to abebooks. Our aim with regards the Stevenson Trail is to visit as many of the villages he stayed in and passed through and to walk parts of the trail where possible. 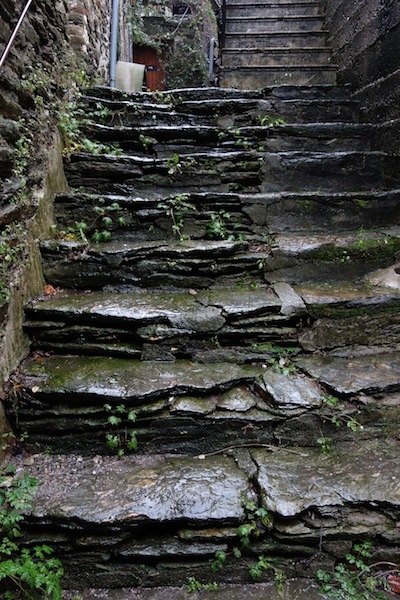 The trail passes through the Cevenne, Mt Lozere, Gevaudan and Velay regions. 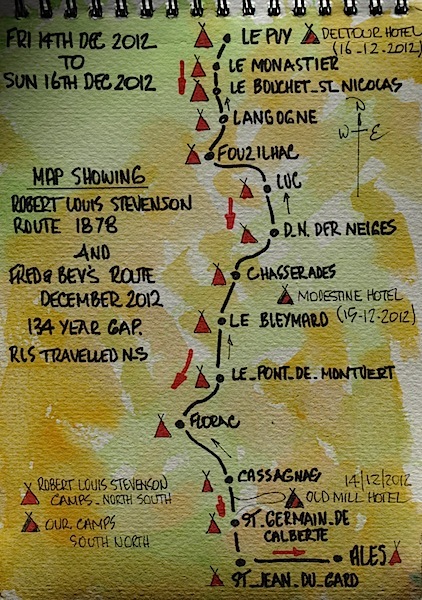 Robert Louis Stevenson commenced his journey near Le-Puy (top of map) in 1878 and travelled to Ales in the south. We are doing the trip in reverse mainly because we wanted to get as far south in France as possible at the start of this little jaunt. 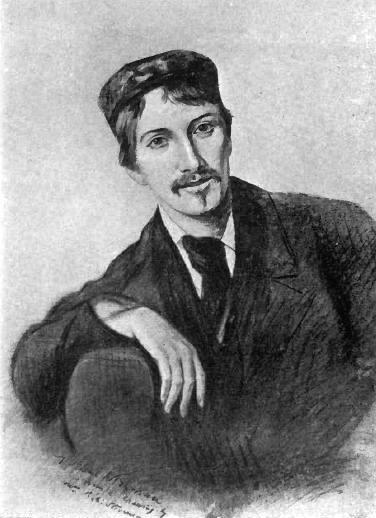 Robert Louis Stevenson travelled from north to south whereas we travelled south to north. 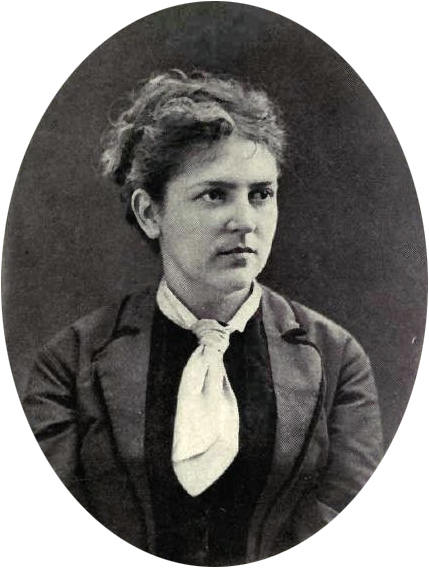 RLS made two expeditions in 1878 and he wrote about both. 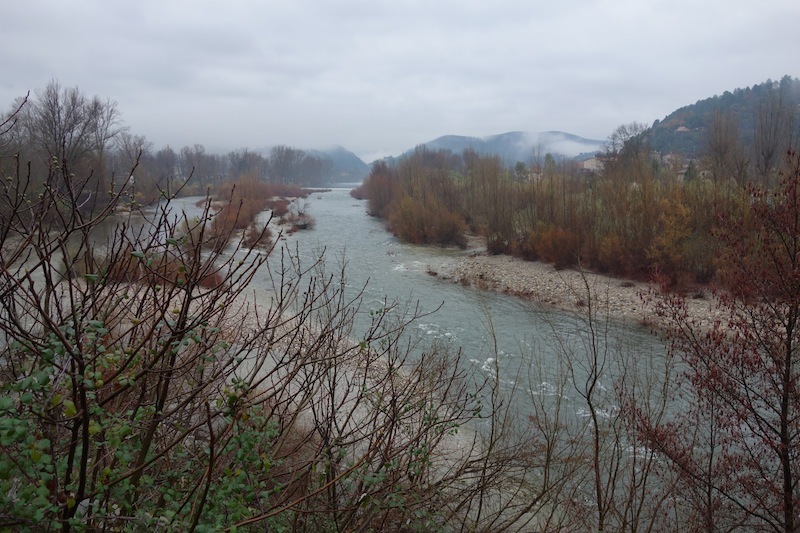 The first was an account of a journey he made by canoe from Antwerp to northern France and the second was Travels With a Donkey in the Cevennes. 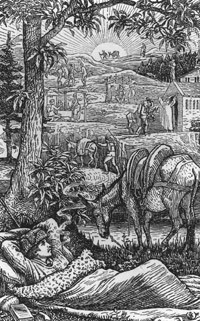 It was in September 1878 when Stevenson set out on foot from Monastier sur Gazeille with his donkey Modestine. 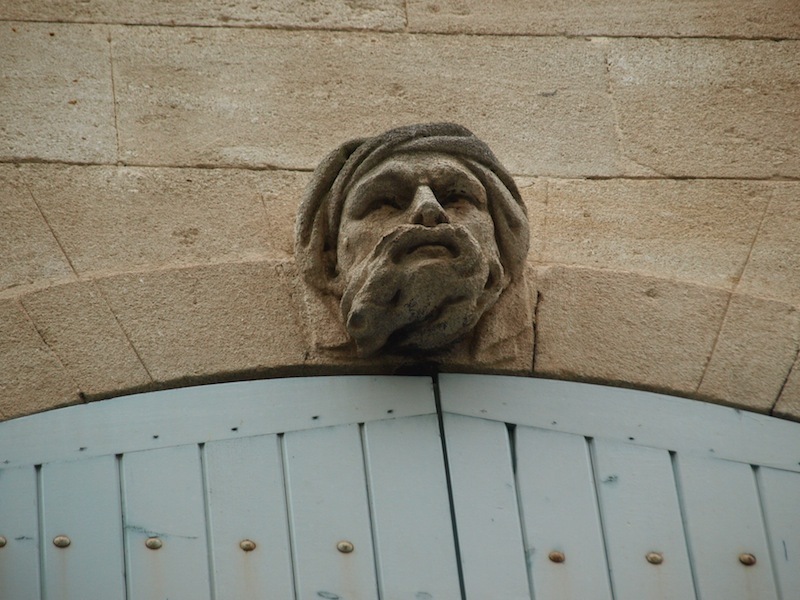 Twelve days, 225 kms and many adventures later, he arrived at St Jean-du Gard, where we commenced our journey today. 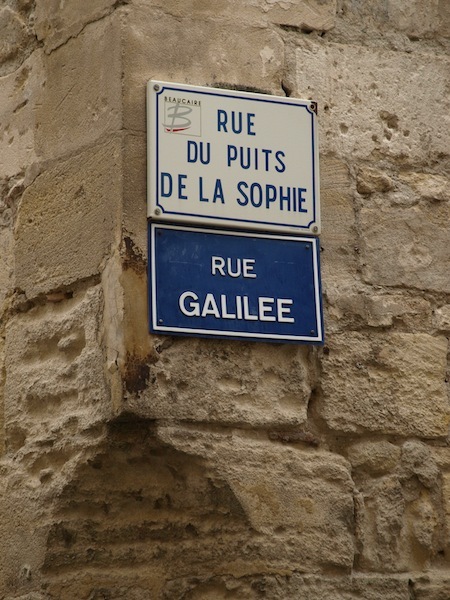 There were two reasons for his journey – to try and forget his love for Fanny Osbourne, the beautiful American woman who he in fact eventually married some years later – and to explore the Cevennes region, the only part of France where Protestantism still prevailed after the ‘wars of religion’ and purges of the 17th century. The Protestants of the Cevennes were known as Black Camisards (because they attacked at night) and the Catholic Camisards were referred to as White. Stevenson in his sleeping sack. 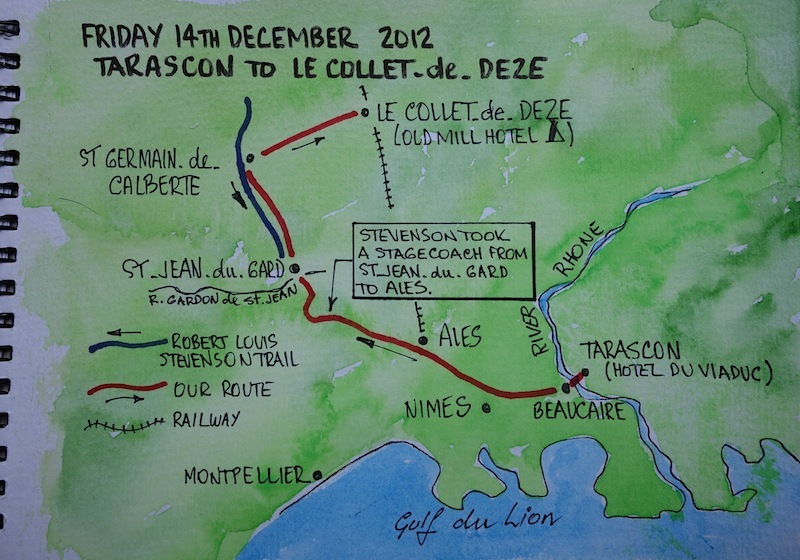 During Stevenson’s twelve-day journey he camped on four nights and the remainder were in inns, a monastery and a hotel. 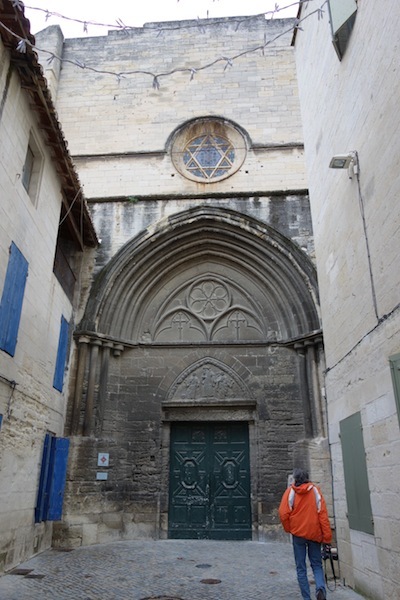 We arrived at St Jean-du-Gard (where Stevenson finished his journey) at lunchtime and as is the case in this neck of the woods everything was shut including the tourist information so whilst waiting we went for a wander. 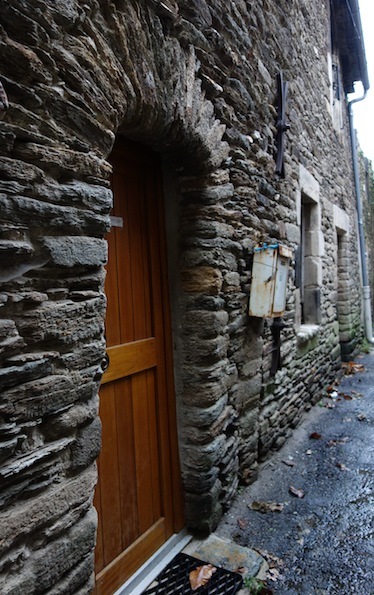 The town attracted us immediately as there were narrow alleyways running every which way and the buildings were ancient. 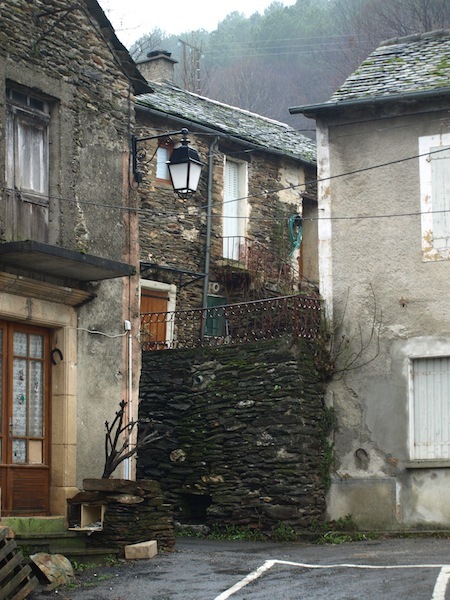 If the villages along the trail are going to be like they are in St Jean-du-Gard it is going to be a fascinating journey. 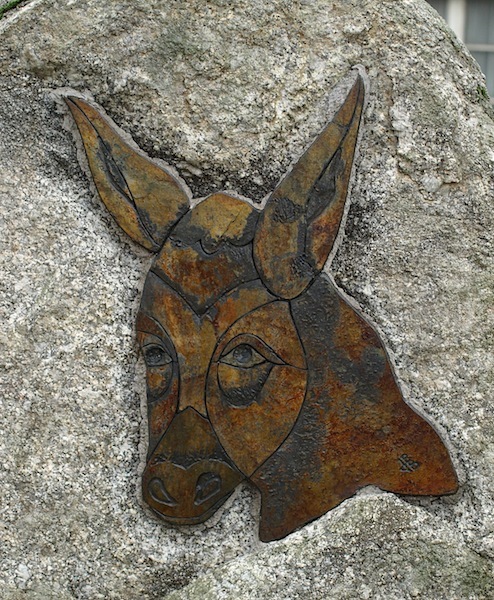 Ceramic image of Stevenson’s donkey Modestine outside the tourist information office. 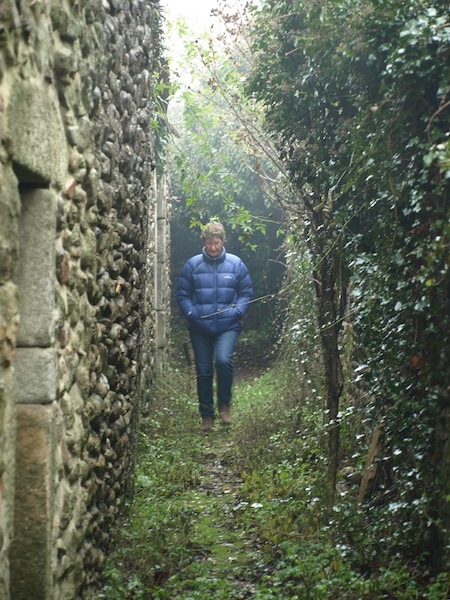 Bev in a back lane of St Jean-du-Gard. Leaving the lanes behind we headed for the next town on the RLS trail St-Germain-de-Calberte. The road climbed and fell, twisted and turned and I can tell you I would not have been happy sitting in the passenger’s seat as from the road the country dropped well over a hundred metres to the river below. There were no guardrails for most of the drive and it was barely wide enough for two cars to pass. When a car came in the opposite direction I manoeuvred the passenger front wheel as close to the edge as possible and stopped, allowing the oncoming vehicle to pass safely. Icy day and icy river. 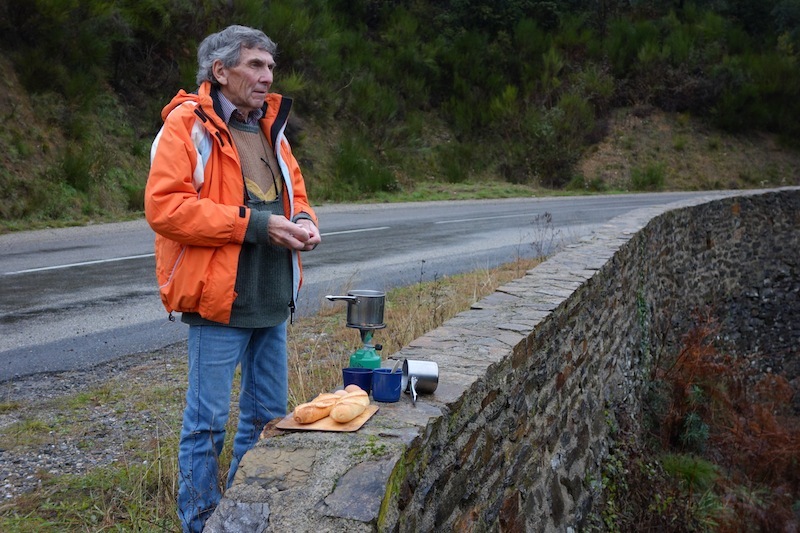 Not all roads in the Cevennes are as comfortable to drive on as this one. Impressive landscape with railway bridge across the river. 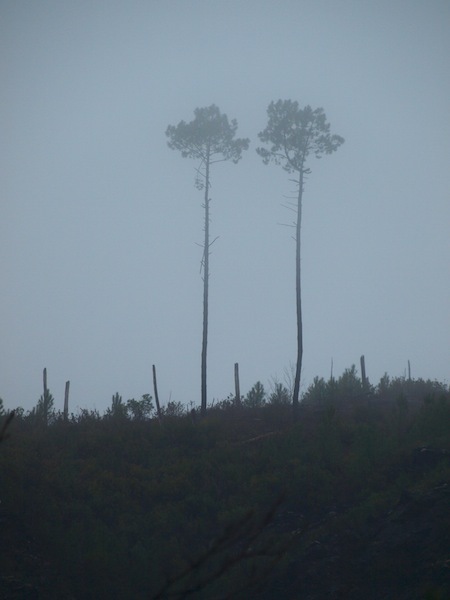 It was damp and foggy by the time we arrived at St Germain de Calberte. Amazingly there was a small tourist information office open and the lass in attendance was most helpful in guiding us where to go and what to see. 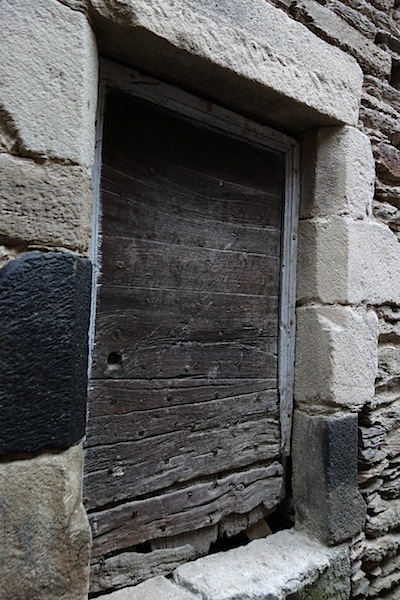 How old is this door and when was it opened last? The black stone in the left door jamb could be black marble . In the region there are extensive deposits of mudstone, just the material for step and house building. I could quite easily live here for a while. 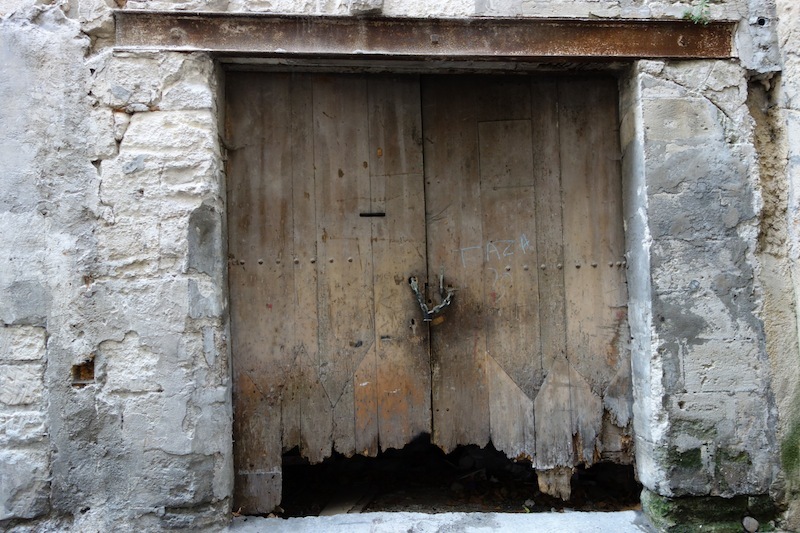 A tool gate in St Germain de Calberte. 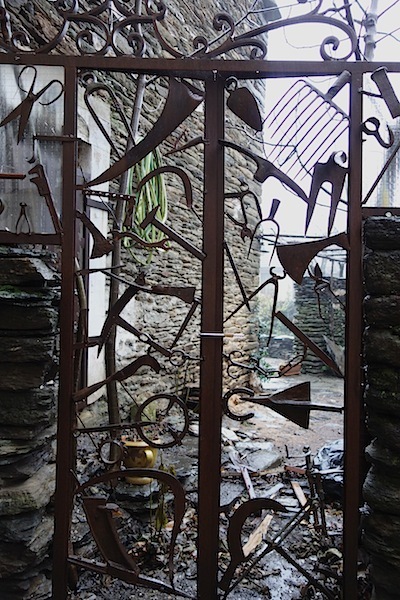 The gate was made up of a variety of tools. 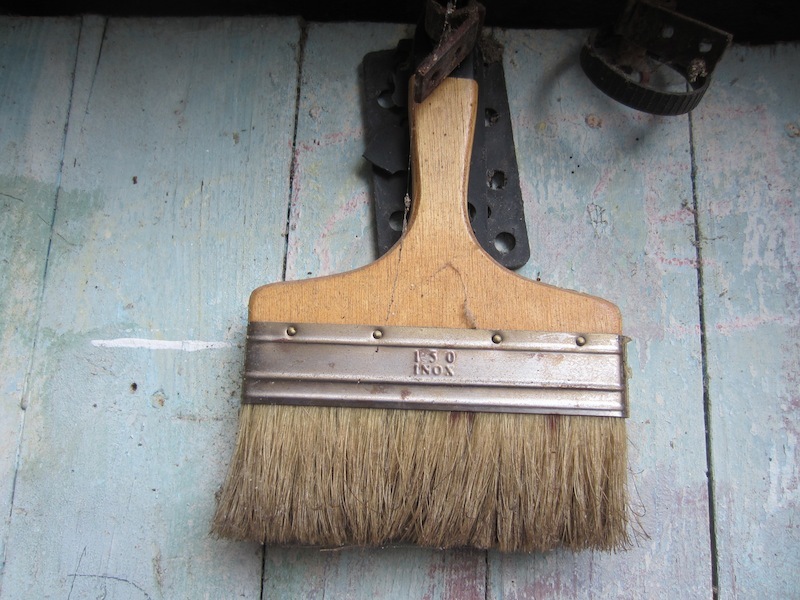 A few of the many tools included a pair of tin snips, a scythe, a worn hoe, a pick head, sickle and hammer, pincers, tines and blacksmith’s tongs. Tonight we are snug in the Le Vieux Moulin Hotel (Old Mill Hotel) in the village of Le Collet-de-Deze . The mill referred to above is opposite the hotel and was used to grind chestnuts, not grains. The chestnut flour was used to make various chestnut desserts.